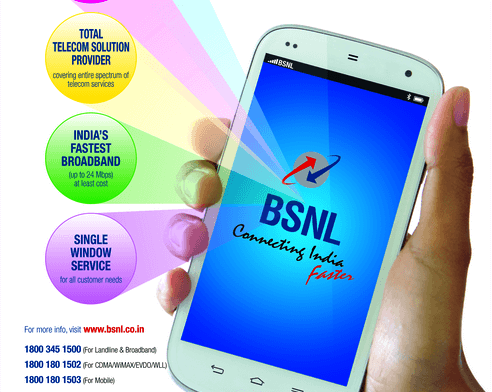 The public sector telecom giant, BSNL is introducing Diwali Bonanza by offering 10%extra talk value on existing STV's. The new tariff will be applicable from 15th October 2016 to 31st October 2016. BSNL has also introduced many combo offers attractive to youth and student segment offering extra talk value with free data under prepaid mobile services. These offer will be available across India. Director (CM) BSNL board, Shri R.K. Mittal said that "We are offering attractive plans & scheme time to time to our esteemed customers for their valuable support & feedback , for more details log on to our web site - www. bsnl.co. in"
10% extra talk time is given on existing STV-159, STV-201, STV-359 &STV-449 The above tariff will be applicable as a promotional offer with effect from 15-10-2016 to 31-10-2016 on PAN India basis. How to activate these Voice STVs? Combo vouchers of smaller denomination having both voice & data for Rs.13/- Rs.14/-, Rs.15/-, Rs.77/- & Rs. 177/- have been launched for promoting data services. These Promotional Combo Vouchers will be available from the date of implementation by the respective circles to 31st December 2016. For Kerala Circle, Combo STV 15, Combo STV 77 & Combo STV 177 are available from 15-10-2016 to 31-12-2016. These STVs are available to all prepaid customers in all plans. How to activate these Combo STVs? To activate promotional combo vouchers, just recharge the denomination of required combo voucher. Dear readers, please share your views and opinions about BSNL's Diwali special offers via comments with us.